Few weeks before, it was raining here. Actually it was a heavy one. The folks at home wanted to have something hot to keep themselves warm. I thought preparing soup would be a nice idea. Soups don't present in our daily menu but occasionally it pops up. That's the reason, my blog has only limited number of soup recipes. 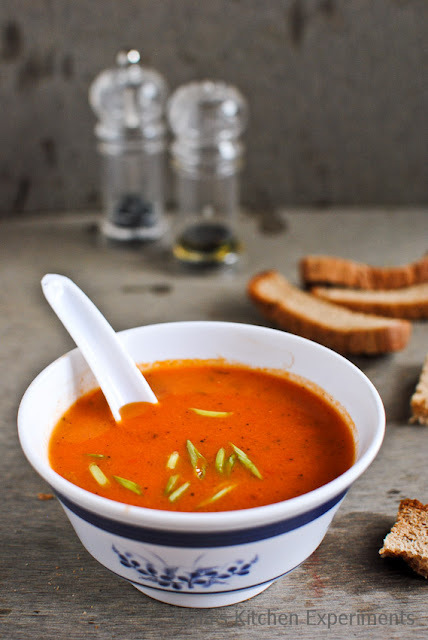 Since I am also not a great fan of it, I knew only few soup recipes and among them, tomato soup saves me every time when my family wanted to have soup. :-) This time, for a change, I added roasted red bell pepper to it. Right from the day when I tried red bell pepper chutney, my family become a fan of red bell pepper. Anything with red bell pepper would become a hit at home. With the same hope, I added red bell pepper to the tomatoes and made soup, served hot and as guessed, I got a good feedback. 1) Wash the red bell pepper and wipe using kitchen towel. Roast it by placing it over the open flame until the skin turns black all the sides. Set it aside for few minutes. Peel off the skin once cooled down. Remove the seeds and slice it roughly. Set aside until required. 2) Heat oil in the pan. Add garlic and fry for few seconds. Add onion. Saute till it becomes soft. 3) Add cubed tomato and cook till it becomes mushy. 4) Add roasted, sliced red bell pepper. Saute it for few minutes and allow it to cool. 5) Once cooled, grind it to a smooth paste. 6) Heat butter in a heavy bottom and deep pan. Add all purpose flour and mix well without any lumps. 7) Add the bell pepper, tomato paste and water. Mix well. 8) Add Dried oregano, thyme, salt and pepper. Mix well again. Bring it to a nice boil. 9) When the soup reaches the required consistency you want, turn the flame off. 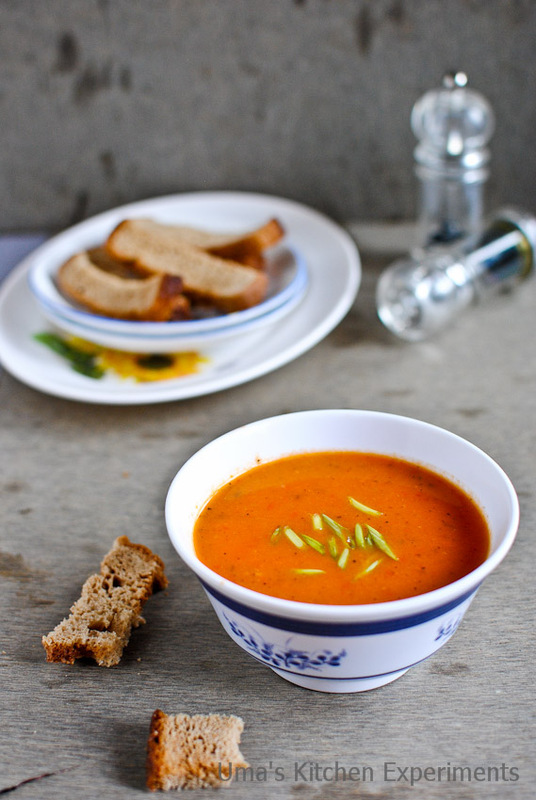 10) Pour the soup in bowls, garnish with chopped spring onions and serve hot. We enjoyed it with baked and flavoured bread slices. 1) I added equal quantity of red bell pepper and tomato. Add more number of red bell peppers to get its flavor. 2) This soup pairs well with croutons. 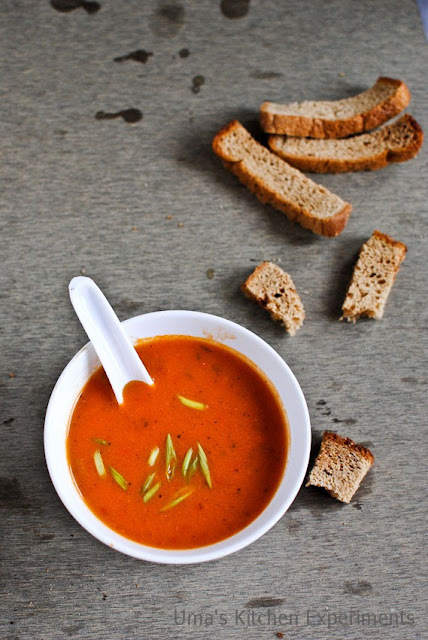 If you don't have any by the time you prepare the soup, slice the bread and toast it until crisp. Serve them with soup. love the flavor of roasted bell pepper. love to see you at my space too. 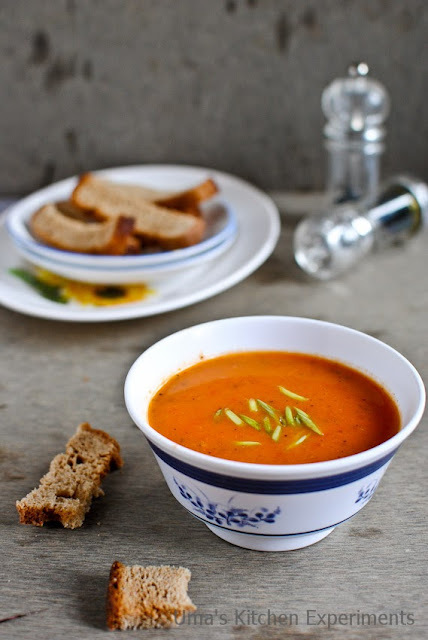 Very tempting and eye pleasing flavourful soup..Love that bowl. nice combo n very filling soup.. I tried with my OTG ! but not adding Tomato ! wonderful and filling soup ! Colorful and lovely looking soup. love soups anytime.. espcl wen it rains..